Bingo Diamond Mobile | You Have £30 Bonus Cash Here! Are you looking for the diamond in the rough? Then it looks like this could be your lucky day as Bingo Diamond is ready and waiting for you to try out its huge range of sparkly games, gleaming promotions and polished welcome bonus for new players to the site! This shimmering site has plenty to keep players of all skill levels entertained, so head on over now and prepare to be dazzled. It’s brought to you by Broadway Gaming, the same company responsible for Butlers Bingo and Glossy Bingo, so you can rest assured you are dealing with a quality operation. New players may not receive a shiny diamond upon joining this site but there is no need to worry as you will instead be granted a massive welcome bonus. Newbies can sign up to the site today and make their first deposit to receive a fantastic 300% bonus! This means that you can join today and make the minimum deposit of just £10 to get started playing the exciting range of games on the site with £40 instead. Not only that, Bingo Diamond is feeling very generous to its new players and you will not only receive bonus cash with your first deposit, you will also receive 100 free spins on the Sun Tide slot game. 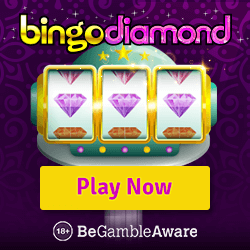 If you want to enjoy the range of games that this site offers on the go you can always log in through your mobile browser at www.bingodiamond.com. This will then give you access to lots of exciting games no matter where you are! This site, unfortunately, does not offer a downloadable mobile app for either iOS or Android devices, but we don’t think you will miss it with this mobile optimised site. £30 bonus when you add £10 to your account. 100 extra free spins when you first deposit £10 or more. Bingo Diamonds offers its players two standard games of bingo. You can start playing games of 90 ball and 75 ball bingo, however, the site is limited to just these games and you won’t find any other fun variations such as 50 ball bingo. This site does offer a variety of cool rooms such as the Immortal Romance room, Spinner Room, Friendship room and Sapphire room. Plus, no matter what your budget is, you will find a game to suit with tickets starting from as little as 1p! Bingo Diamond offers over 170 games to pick and choose from and this includes a variety of video and progressive slot games. Players can play for huge cash wins with the popular slot game Mega Moolah, go on an exploration for treasures with Jungle Jim El Dorado, meet the fearsome Nordic god Odin in Thunderstruck II or fulfill your sweet tooth with the fantastic slot Candy Dreams. If you are a high rolling player looking to hit the big time players can enjoy playing a wide range of thrilling casino games. New players can get started with fun games of European Roulette Gold and Classic Blackjack Gold, while more experienced players can try their hand at playing games of European Roulette, Jacks or Better Poker, American Roulette, and Hold’em High amongst much, much more! 50x bonus wagering required, max bet £6.25 until completed. Game weighting applies. 2 day expiry for bonuses. eWallets excluded. T&Cs apply. Play Responsibly | Minimum deposit of £10, Play with £40 and Get 100 Free Spins. 300% Bonus up to £100 on Bingo Offer must be claimed within 48 hrs of you registering an account. Bingo Diamond is a fun and simple site that is sure to appeal to many new players to the online bingo site. While we love that there is a huge range of slots and casino games to choose from, we do wish there were some more bingo variations to play and a few more seasonal promotions to keep players on their toes. However, if you are looking for an easy to use website that offers all the basics this is a fantastic option. There are some huge progressive jackpot games on slots, so if you are into this type of gaming, this is one of those sites you definitely shouldn't miss!